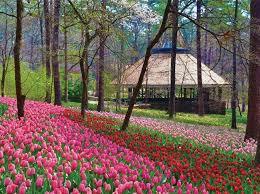 Join us for a day trip to Garvan Woodland Gardens in Hot Springs, AR. Tickets are $15 for the gardens with a suggested donation of $10 for the van rental. We will eat lunch at Fisherman’s Wharf and then visit the gardens after lunch. The Tulip Extravaganza 2017 is going on and the tulips should be in full bloom in various colors. We will leave church at 9:30 Saturday morning. Please RSVP to make sure there is room.